However, down 2-3, following a service winner by Williams, Morita committed a miscue to stare at double break point. 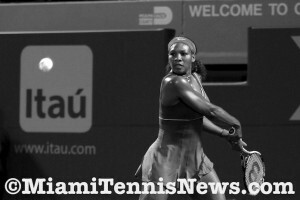 When the Japanese’s forehand volley sailed wide, Williams secured the break for a 4-2 advantage. With Williams serving for the match, Morita battled to 30 all thanks to a net cord return winner and a sensational dropshot winner. It was all for not though as Williams struck an ace to get to match point. She converted on a mistake by her opponent. Caroline Wozniacki, the ninth seed and former world number one, was upended 6-2, 6-4 by 19 year old wildcard entrant from Spain Garbine Muguruza. Seventh seed Petra Kvitova was shown the exit by Belgium’s Kirsten Flipkens. Sloane Stephens also advanced to the fourth round as Venus Williams pulled out of their match due to a back injury. Defending champion Agnieszka Radwanska held off Magdalena Rybarikova in three sets.